La Raza | Hip Hop With A Difference, Old Chap! Hip Hop With A Difference, Old Chap! 08 Mar Hip Hop With A Difference, Old Chap! Finding a funky band or a soulful singer at La Raza, any day of the week is no surprise, but this week, at our regular Neon Moon Cabaret Club, we have a pretty unique performer. This is hip-hop with a healthy dose of British and big old dollop of posh! If you haven’t yet heard of chap-hop – then you’re in for a treat. 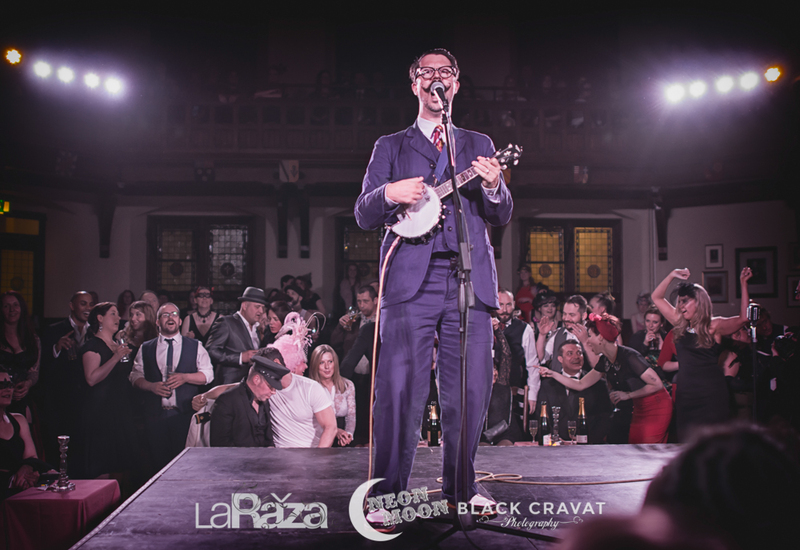 A quintessentially more English character you are unlikely to meet – Mr B the Gentleman Rhymer has taken YouTube by storm, and the British Media too, With The Independent describing him as ‘Sublime Genius’. In 2007, Mr.B decided to bring elements of his previous incarnations (UK rapper, jump-up breaks producer, banjolele maverick and dandy) together and create a new genre – Chap-hop was born! ‘A Piece Of My Mind’, his first ditty was released in Japan on Second Royal Records and its accompanying video and UK tour dates alerted the rest of the world to this new musical form. Since then he has travelled the world, from Banstead to Berlin, Norway to New York and the Edinburgh Fringe to Glastonbury bringing his beats, rhymes and his exquisite manners too. As well as songs about cricket, pipe smoking, high society and interfering with livestock. Add in some delicious cocktails, and tasty tapas, plus the funky electro sounds of DJ Smyley Jay and you have a pretty spiffing evening ahead of you. We can’t wait. Chin Chin. Tickets here, plus go to our events page find our full programme of cabaret acts coming up for March, including Des O’ Connor, the Sure Can Playboys, Kiki Deville, and the master juggler ‘Stone Thrower’.